The service represents an important stage of the game, maybe the most important, because from it depends his own process, that is the strategy of the game. The serve is a factor of a dynamic and vivid technical knowledge, and never as in this stage the player has a complete control of his own skills. The peculiarity of being vivid and dynamic means that the serve permits many variations in terms of spin, speed, direction, position, length, and, in opposition to other strokes, serve is influenced by nothing but the own player, in the instant when he throws the ball. The serve is strictly connected with technical, tactical and psychological factors. In many occasions I expressed this definition: the serve is a mental condition. Actually, the psychological factor, extremely present in ping-pong, finds here his extreme expression. Just think at those particularly delicate moments of the match as, for example, the final points of a game or of a match. Before analysing the serve from a technical and tactical point of view, it will be useful to remember that ping-pong rules impose a correct execution of the serve, otherwise punished with a warning, or worse, with the assignment of the point to the opponent. — as soon as the ball is thrown up, the free server’s hand must not be placed between the ball and the net, so that the ball can be clearly visible to the opponent. Whether the serve is played with backhand, or with forehand, it is a stroke like any other, that’s why, to improve it, we must train it well, such as we train topspin or other parts of the game; for a good technical execution, serve follows the same technical rules like the other strokes, such as preparation, approach to the ball, acceleration and final movement. There are many ways to execute an effective serve: one of them is the ability to conceal different spins with as similar as possible movements. To execute an effective serve we must also think about some technical and tactical aims: next we’ll see how much the psychological aspect will influence the quality of the serve. The throwing of the ball must be precise and without hesitations. A wrong throw could compromise a good result. Particularly important is the moment of the contact with the ball. Many players aim to throw the ball much over 16 cm, and sometimes they make throws high 2 – 2.50 meters (since from the early ‘70, Chinese players are leaders in this kind of throw). The goal is twofold: extend the opponent’s observation time, in order to take off his attention and to take advantage of the fall of the ball, which, together with the quickness of the technical act, makes the ball even harder to “read”. In this way, in the moment of the contact of the racket with the ball, we can improve the quality of the serve. The importance of the moment of the contact with the ball is given by the quickness with which we hit the ball: more the contact and the movement are quick, more difficult is understand the kind of spin from the opponent’s point of view. Who serves will try, as we said before, to confuse the opponent, leading him to make a mistake or to return an easily playable ball. If it is true that the opponent can be confused by the quality (kind of spin), it is as much true that he can be confused also by the quantity (of spin). And more: hit the ball quickly allows also to send the ball in an unexpected way into one or into another part of the table. As last feature, give more or less length to this stroke. In any case, serve has two aims: try to win the point straight with the mistake on the opponent’s receive, and lay out the server’s play. To obtain the best as possible serve, it is very important the use of the wrist. Right for his very flexible feature, the wrist is fit for the necessary quickness we spoke above: actually, in the moment of the contact with the ball, the wrist can be an additional variation of the quality of the serve, and make it definitely effective. So, to handle the strategy of play, we can avail ourselves with an enormous tactical potential, that is precisely the serve with all of its variations. Psychological influence plays an important part in the execution of the serve, because it could make fruitless the serve’s effectiveness in terms of quality, quantity of spin, length and direction. Of course, training the act of the serve, we create a sort of muscular conditioning, but, in any way, the nervous aspect, and so a high psychological pressure, very often makes us behave ourselves in the less appropriate way or, at least, reduces in terms of efficacy the own qualities of the serve. Just above I mentioned that a serve must not show hesitations: consequence, in addition to the ineffectiveness, that is low quality, is to make easier to the opponent to take the initiative of the play. Train the serve is very important. The serve allows us to express ourselves in the as more as possible exclusive and imaginative way. Without looking at the pure technical action, my suggestion is, at least at the beginning, to focus on two aspects, or qualitative aims: the intensity of the serve in terms of spin and the length of the serve in terms of the length on the table. Together with those two aspects we must think, organize and train the serve, contextualizing it in the play that we decided to follow. A non-useful or partially useful way to train is to train the serve as an action apart, separately from the rest of the play. To make go together the action of the serve with the next actions, that means with the development of the game, the role of the legs and the action they follow just after serving, become basic. Actually, just after serving, becomes necessary to keep the correct position at the table and prepare ourselves to be immediately reactive, depending on the opponent’s receive and on the intentions we fixed in advance. 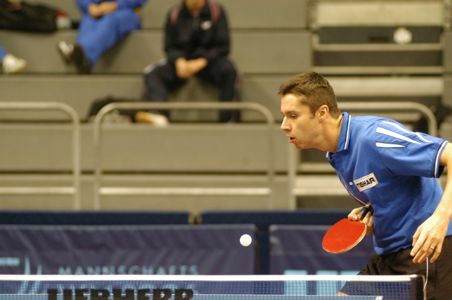 Here below you can see the photographic sequence from Table Tennis Illustrated of ITTF. You can easily see that who serves, in this case the Korean player Oh Sang Eun, even before his opponent hits the ball, stays already in the waiting position, ready to make the necessary decisions. The legs movement, and the correct steps to make, is considered really important, because a wrong step leads to lose a loss of balance, that is a wrong position in comparison with the development of the game. Preparing yourselves to train the serve, you can use all your imagination, paying attention on the basic aspects you learned above. Try to recreate the stages of the serve, its brakes, the considerations you make during the match: this will help you to make as profitable as possible the training of the serve. From the tactical point of view, serve can be used to force or oblige the opponent to open the game, for example making a serve with a positive spin (topspin). Another possibility is to serve with negative spin (backspin), aimed to avoid your opponent’s opening of the game, or to stimulate a short receive from your opponent. In any case, the length of the ball is basic: is clear that a serve is effective if the second rebound on the opponent’s side of the table is nearly close to the bottom line. Another terminology of the same action is when we say that a serve is half long, or just out. This kind of serve, apart from the kind of spin, doesn’t allow your opponent to take the initiative with a topspin, and forces him to a push or, in case, to a flip. Another tactical use could be represented by a long-fast serve. This kind of serve has two aims: force the opponent to an immediately open play, and surprise your opponent with an unexpected, quick, fast and long serve. Many players use this tactical component close to the end of a set, when the nervous strain is at its maximum degree and the psychological pressure could play bad jokes. For all tactical applications, we can say that the kind of spin is caused by the impact of the racket on the ball. Iconographical description of the kind of spin is given by imagining the ball as a watch: when the ball is hit at 4,5 or 6, it means that the kind of spin given is a backspin, with different degrees of intensity of the spin. If the ball is hit at 3, the ball will have a null or neutral spin. Another description can be given imagining the ball as a globe (children like more the watch example). So we can say that if the racket hits the Equator, we’ll have an almost null spin, while if it hits the South Pole, the ball will have a lot of backspin. When you will train the serve in an individual and analytical way, avoid to play more and more serves, as if the improvement was due to the quantity, or rather to the number of the serves played. Try to play the serve with the stages and the movements that you’ll do in the match. It is better to train less but quality serves, instead of many but low quality serves. The next article focused on the technical aspect will be dedicated to the receive.